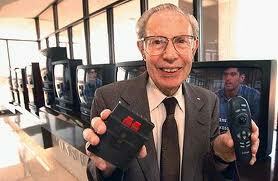 Robert Adler, the Austrian - born American scientist is the inventor of wireless remote control system for televisions. Robert Adler was born in Vienna (Austria) in 4th December, 1913. He did his education in vienna itself. In the year 1937, at the age of 24 he earned Ph.D. in Physics from the University of Vienna. In 1939, he left country, because of annexation by Nazi Germany. Then he travelled several places and finally he emigrated to United States of America. After emigrating to US, Alder joined Zenith Electronics Corporation (a brand of LG Electronics) as a researcher and he continued the same company until his life time. He retired officially on 1982, as director of research department and vice president of the company. He was granted 58 US patents in his lifetime. In 1980, he got IEEE's Edison Medal and in 1997 he got Emmy Award. On February 15, 2007, at the age of 93, Robert Adler died due to heart failure.